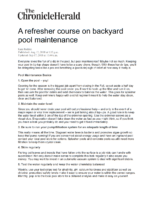 Everyone loves the fun of a dip in the pool, but pool maintenance? Maybe not so much. Keeping your pool in tip-top shape doesn’t have to be a scary chore, though. With these handy tips, you’ll be delegating tasks like a pro and breathing a (poolside) sigh of relief at how easy it really is. 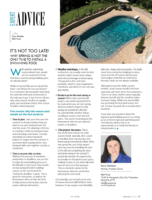 According to Health Canada, there are two ways to sanitize a pool: chlorine and bromine. 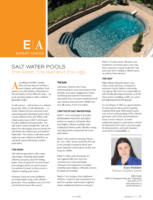 Pool owners can add chlorine or bromine to the pool water in four different ways – by puck, granular, liquid or with a chlorine generator (salt). 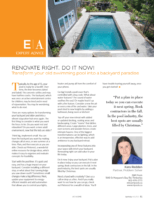 ReFINEd Magazine Expert Advice Column – Renovate Right. Do it Now! 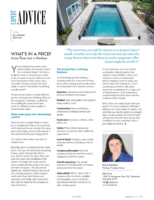 ReFINEd Magazine Expert Advice Column – What’s in a Price? You’ve decided you want a new pool installed, and now the search for a company begins. You have a budget in mind, an amount you cannot or do not want to exceed. When it comes to an investment of this nature, price can make or break a dream. But what really is a price? And what is something actually worth? Pools and hot tubs maximize outdoor fun. Before you make the big investment and start digging, though, know all the facts. With another swimming season almost here, would you be surprised to know that those coveted spring building spots are already taken?